The 1970’s has never been my favourite decade. I base this view mainly on the decades fashion. Although oddly enough, as I continue to delve into the fashion archives for my own wardrobe I find myself more and more into the 70’s fashion. I will however, always believe that my mother’s leather vest with tassels on it should stay permanently in the 70’s and never emerge in the future. It does continue to hold on to dear life in the wardrobe though. 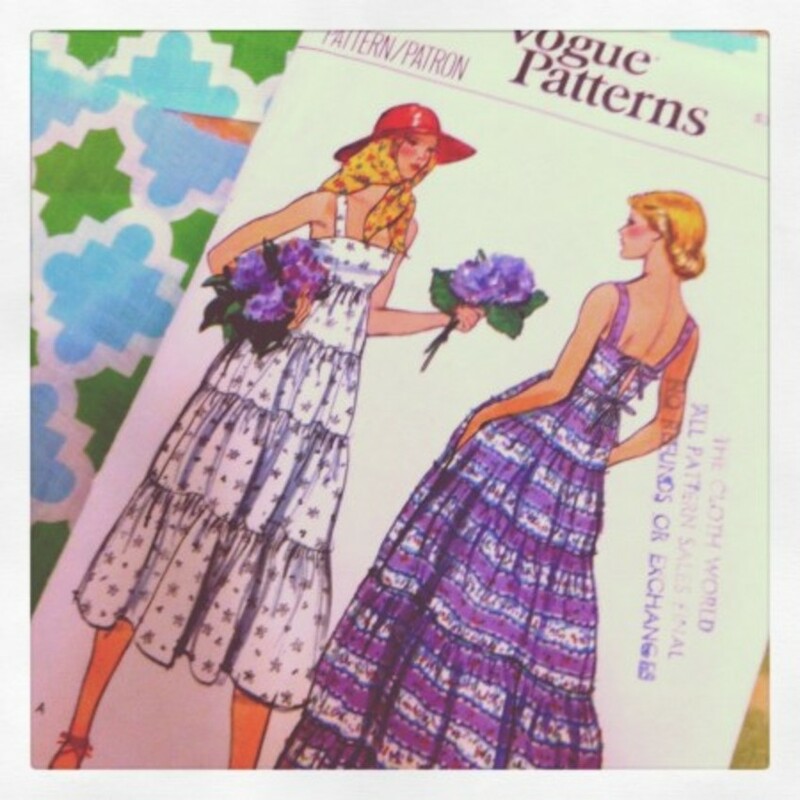 Every so often I get huge joy from searching EBay for vintage patterns. You can get very lucky and buy a good quality hardly worn pattern on the cheap. Or you can purchase something and find it very ripped up. 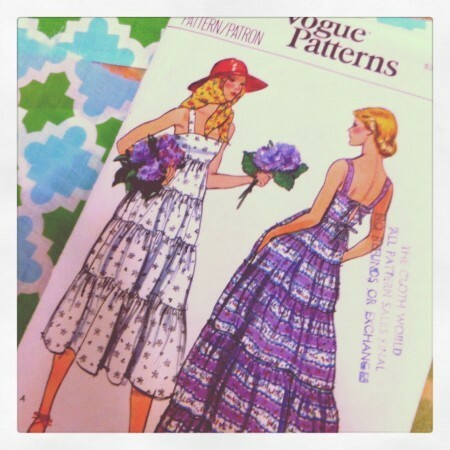 I experienced the former last year when I found this little nugget from Vogue patterns. It doesn’t seem to have the date on it anywhere, but I think it’s safe to assume this little number was imagined up in the 1970’s. I’m not sure if I like it because of the floral material in the image (I am obsessed with floral!) or the fact that it reminded me of Mum’s bridesmaid dress she made herself for my aunty to wear at her wedding. I got lucky with this pattern as it was in good nick and hadn’t even been cut out – result! I cut it out for a size 10 given most of the dress isn’t fitted except for the bust area and I have not been blessed with ampleness in that department. I purchased a voile material from The Fabric Store in Surry Hills. I noticed they had the material in two colour ways and decided that I would use different colours for each tier. It was a beautiful voile fabric and quite sheer, but thanks to the bright pattern on it, it wasn’t see through. I loved how the back on this finished with the ties. I worried about the fit on this given the smaller size and the fabric was a little slippery making fit a bit challenging. However, once I had sewn it up I knew this would be a wardrobe winner for summer. It’s breezy, comfortable, bright and happy. I’m sure I could be accused of being pregnant wearing this dress but I don’t care, I just love it! If you can hunt this down anywhere, give it a go. It's gorgeous! I love old patterns! So do I. I was so lucky to find this for about $3 on Ebay and uncut!